A first-of-its-kind anthology, the book written by Aiyushman Dutta, offers a peek into the life and culture of the people of the region through the prism of their food. It includes more than 30 insightful narratives by prominent writers from the Northeast and researchers. The book deals with cuisines of all the northeastern states. Smoked meat, fish, pork, meat, bamboo shoots, Vunenuo or special stew chicken, Akhuni are some of the special dishes of the region. "When we go outside people often ask what type of food you eat? So it's not only about how we sing and dance but food is important so we have started taking our cuisine expert so that people will also taste food and they will appreciate it," said Som Kamei, Director, NEZCC.
" 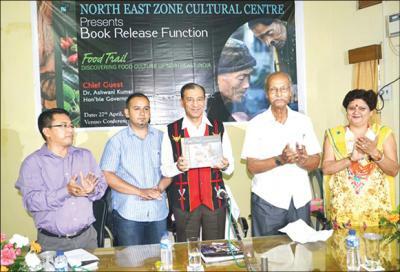 Through this book people will come to know about our rich culture, tradition and about our food culture," said Jyoti Das, writer. "Food Trail" is a highly unusual book and a first-of-its-kind. It will help people from across the country learn more about the culture, traditions and people of the northeastern states.